Founded in 1887, the Penn Museum (University of Pennsylvania Museum of Archaeology and Anthropology) is an internationally renowned museum and research institution dedicated to the understanding of cultural diversity and the exploration of the history of humankind. In its 130-year history, the Penn Museum has sent more than 350 research expeditions around the world and collected nearly one million objects, many obtained directly through its own excavations or anthropological and ethnographic research. 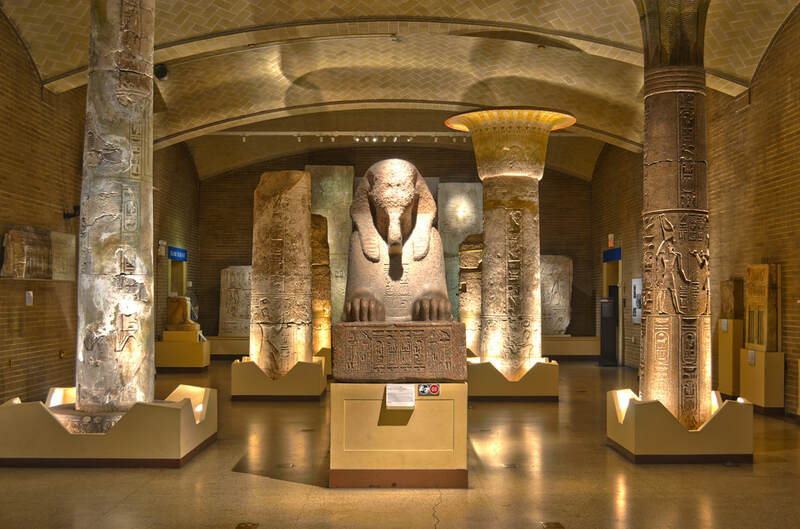 Three gallery floors feature art and artifacts from ancient Egypt, Mesopotamia, North and Central America, Asia, Africa, and the ancient Mediterranean World. Highlights include monumental architectural elements from the Palace of Merenptah and a 15-ton granite sphinx—the largest in the Western Hemisphere; ancient Maya stone monuments; renowned Buddhist sculptures; clay cuneiform tablets bearing some of the earliest writing in the world; West and Central African masks; and Native American pottery. Special exhibitions drawn both from the Museum’s own collections and brought in on loan enrich the gallery offerings. Penn Museum’s collections are housed in a grand and unique Arts and Crafts and Eclectic-style building; the master plan was developed in 1895–96 by Wilson Eyre, Walter Cope, John Stewardson, and Frank Miles Day, leaders of the late 19th century architectural movement toward artistic freedom and aesthetic idealism. The first wing was completed in 1899, with subsequent additions in 1915 (the Rotunda), in the 1920s (the Coxe and Administrative Wings), 1971 (the Academic Wing, designed by Mitchell/Giurgola), and 2002 (the Mainwaring Wing, by architects Atkin Olshin Lawson-Bell with landscape architect Olin Partnership). Public gardens feature a koi pool, as well as fountains and sculpture by Alexander Stirling Calder, and provide contemplative urban green spaces. The Museum offers a wide variety of special events to inspire and engage people of all ages, from Museum Playdates for preschoolers, to Second Saturday and World Culture Days for families, to P.M. @ Penn Museum “School Nights” programs for young adults, to gallery tours, lectures, concerts, and symposia. Coming in April 2018: the Museum opens a new suite of Middle East Galleries which will invite the visitor to travel on a remarkable 10,000-year human journey, from life in the earliest villages and towns to increasingly complex cities. About 1,200 objects from the Museum’s collections—including such world-renowned treasures as the crowning jewelry of a Sumerian queen from 4,500 years ago and the famed Ram-in-the-Thicket statuette—will be on view.